This week, I’m joined by Ana Gillon. Ana is a mother, wife, and project coordinator. She has been on a meandering journey of self-understanding since she was diagnosed with ADHD five years ago. A self-proclaimed “wandering creative,” Ana was part of a recent ADHD reWired Coaching and Accountability group. In this conversation, you will hear Ana tell her ADHD story. She talks about ADHD and the idea of giving your ADHD a job. Ana explains how the ADHD reWired Coaching and Accountability group is helping her. She describes how the use of bread crumbs and other techniques from the group helps with organization. Ana also shares her planning strategies, which includes necessary adjustments. Investing time into planning helps build an attainable roadmap. [07:47] – Ana talks about how her diagnosis came about and found this podcast. She talks about the discovery that she is a “hot mess”. [12:00] – Ana shares a personal story about the co-parenting of her son and explains how this situation helped her understand that her ADHD was impacting her life. [16:00] – Ana describes how she saw herself as an employee in the workplace when she was issued performance plans. [18:44] – Ana explains what a project coordinator is and how this is a position you would not expect to be filled by a person with ADHD. [23:37] – Ana talks about working in a corporate environment with ADHD. She would not recommend the strategy she has historically taken, avoidance. [27:37] – It has been two years since Ana started in her current role. She explains how her mindset has recently changed. [30:59] – Ana talks about how she uses the bread crumbs strategy that she learned in the ADHD reWired Coaching and Accountability Group. [33:08] – Ana explains how she uses a Google calendar and a paper calendar together. [39:32] – Ana explains that the more she makes bread crumbs and other strategies as part of her routine, the less energy she is putting into single decisions. [42:05] – We talk about using Craigslist as a storage locker. [43:34] – Ana shares her strategies for going through her stuff. [46:50] – Ana talks about how she plans, and she describes how planning gives her comfort. [56:32] – Ana explains how her strategies mesh with her husband’s organization. I share a suggestion with Ana to help with these situations. [1:00:27] – Ana shares some advice for the spouse of someone that will be participating in the ADHD reWired Coaching and Accountability Group. [1:05:42] – Ana describes where she would like to be in five years and what she is doing now to work towards that goal. 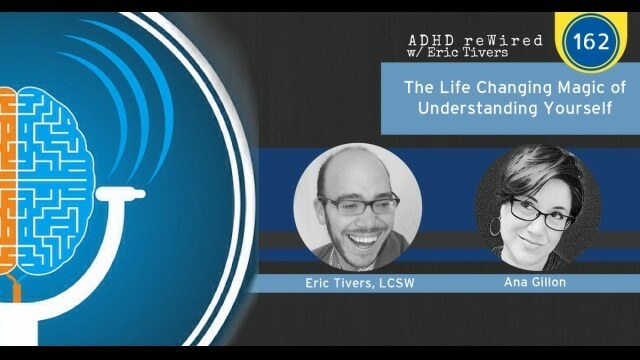 [1:08:53] – Ana talks about the biggest change that she’s seen in herself since becoming part of the ADHD reWired Coaching and Accountability group. 161: Is it worth the Risk?